I have held FGT in my ISA for the past 5 years. It continues to deliver and remains one of the top UK Income Trust in terms of net asset value and share price performance over five and ten years, its returns far outstripping those of the FTSE All-Share index. A sum of £1,000 invested 10 yrs ago would now be worth £2,867 compared to a total return of £1,756 from the benchmark FTSE All Share index. Its aim is capital appreciation and income combined, with a total return in excess of the FTSE All-Share. He holds shares for the long term regardless of short-term volatility, aiming for them to double or more in value over time. This results in extremely low portfolio turnover, which saves on transaction costs. These costs over the past year amount to just £799,000 or just 0.08% of net assets. The trust's total expense ratio remains reasonably low at around 0.7%. The trust has this week announced results for the full year to 30th Sept 2016 (link via Investegate). 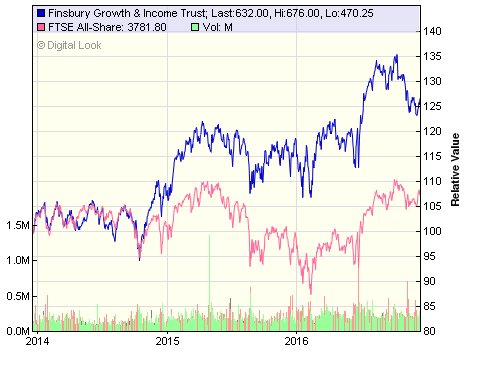 Share price total return is 20.8% compared to 16.8% return for the FTSE All Share. Top five portfolio holdings are: Unilever 9.9%, Diageo 9.9%, Relx 9.7%, London Stock Exchange 7.3% and Sage Group 6.8%. 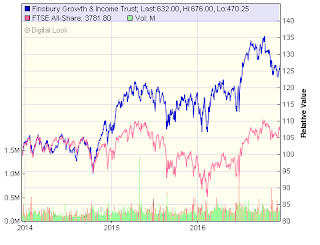 Over the past year the dividend has increased by a respectable 8.3% to 13.1p (2015 12.1p). Revenues were 15.2p (2015 13.5p) and therefore there is a surplus after accounting for payments of dividends which will further bolster the dividend reserves. Commenting on the results, manager Train said "I am more excited about the outlook for global and UK equities – and hence for the shares of your Company – than I have ever been. Almost every company we meet can see an opportunity for unprecedented growth or efficiency gains or both. Investors by and large are far too pessimistic about the outlook. And yet the pace of technology change – even as this creates the opportunities – means more and more potentially ruinous surprises for individual companies". Over the past couple of years I have been moving some of my investment into index funds but I think most investors will acknowledge there are always going to be a handful of managers who can consistently beat the index and it seems to me Nick Train is certainly one of them. You cannot argue with the consistent returns he has provided for shareholders over many years. I am very happy to continue holding.